“In the months before commencement, every communication about the weekend, from emails to social posts, includes the URL ‘commencement.nd.edu’,” Eric says. The main page of the commencement site includes a link to the live stream. People are grateful. Last year’s commencement broadcast, with about 20,000 gathering on campus, drew 4,200 unique viewers from all 50 states and 80 countries. “Many students have friends and family outside the US, and they tell us how happy they are that they can be part of the event from far away,” Eric says. The team plans redundancy at each point. “The reality of life is that things fail,” Eric says. 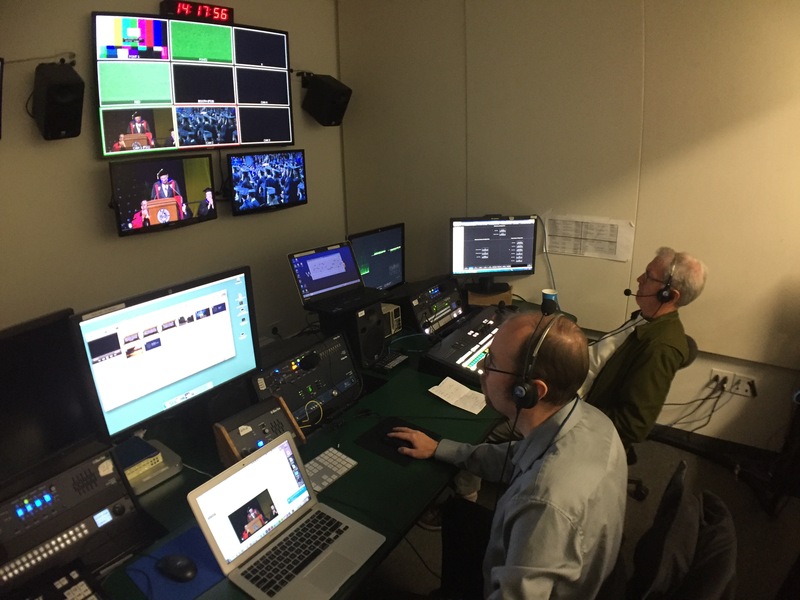 After four years’ experience staging commencement broadcasts, the team now makes sure that each encoder has access to a network jack, for instance, so that the risk of a Wi-Fi connection can be avoided. Redundancy is critical. To serve overflow crowds on campus, events are multicast over the local network to large screens at backup venues. 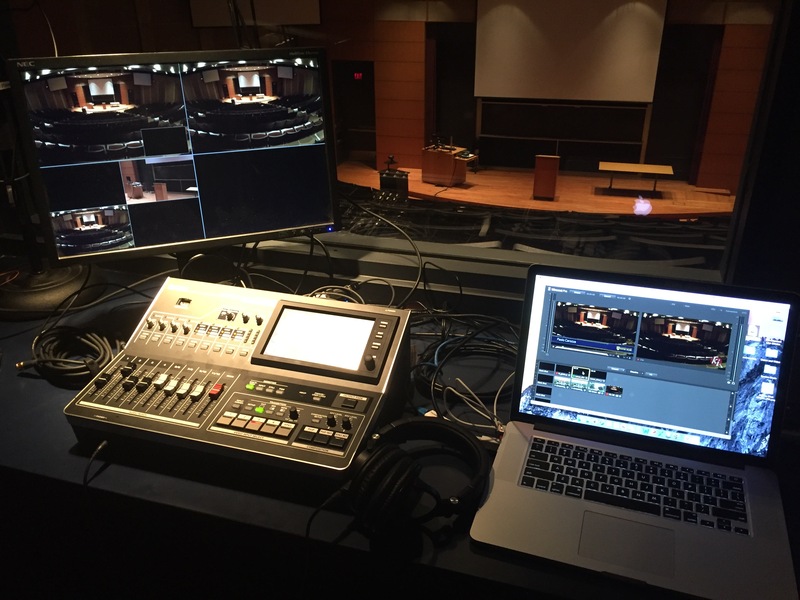 Last year, some devices had difficulty decoding the multicast feed, so the secondary live stream, which was being sent out over the Internet, had to become the primary on-campus signal. It succeeded. When diplomas are issued, the team prefers to use a minimum of two cameras. One is aimed at center stage to get a clean shot of the presenter and the hand-off, and the second is on the side where the recipient exits. A technical director switches back and forth between cameras. “Friends and family members want to see the emotion on a student’s face as they walk off, and you won’t get this quality with a single camera shoot,” Eric says. Live streaming the commencement weekend has worked so well at Notre Dame that the university no longer feels the need to produce post-event DVDs and offer them for sale. “We’re posting the entire ceremony online so it’s available free,” Eric says. More people can watch afterwards, with greater convenience, building good will. “We test and re-test everything in the weeks and days before each event,” Eric says. Equipment, connections and processes for each location are diagrammed in a Google Docs playbook that team members can access and update. “Everyone can see that a given event is sent to a certain channel for primary and another channel for secondary,” he says. Details like these have minimized errors. Playbooks are updated after each event. It’s important to have relationships with video vendors that enable a team to demo equipment before purchase, Eric says. “We might find in advance that a certain component isn’t adequate,” he says. “Without a relationship, if there’s an issue with a component, we’d dump it. With a relationship, we can report a problem and help a vendor fix the problem in their system.” Close vendor communication has kept production quality high and has resulted in product improvements from some vendors, he adds. 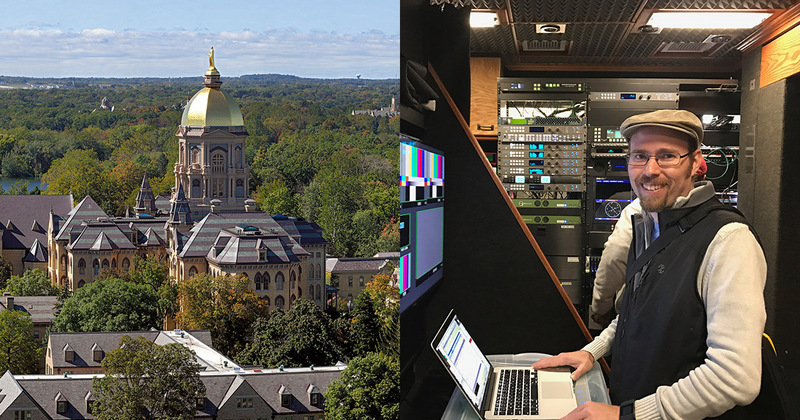 With people from 80 countries watching commencement online, 8,000 viewers for the streamed Fischoff Ensemble Competition on campus, and $2 million raised in the latest online Notre Dame Day fundraising event, streaming video is already playing a large role in the quality of outcomes at Notre Dame. Start with a free trial of IBM’s video streaming services to see how you could achieve similar success.